Gogen Yamaguchi the Emperor of the Scarlet Fist, english, 284 pages, 15 x 23 cm, Special limited Collector's Edition (1000 copies worldwide), certificate of authenticity, written by Don Warrener and comes with a PDF of the entire book and a DVD of all the students who trained with him that became significant in the world of the martial arts. Filled with biographies of his top students and as well unwritten biographies of his teachers and their teachers teachers. Stuffed full of rare and some never before seen photos of the founder of Japanese Goju and his students plus a complete unbiased history of him from the womb to the tomb. The author Don Warrener has come up with yet another masterpiece on the man who brought America to its knees by his unusal charisma and his ability to mesmerize people. 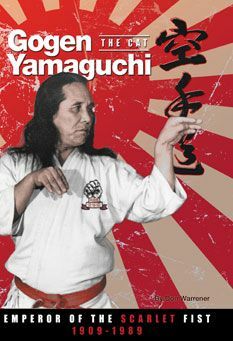 He was a very very special man and this book is the once and for all analysis of a truly great master of the martial arts. There are over 145 rare and many never before seen photos in this book as well. These have come from several different archives who have donated to this project. It is placed inside a slip case box and has a DVD of Yamaguchi performing all in Black and White and as well their is a PDF of the entire book on a CD which can be placed in your computer so you can read it anywhere you like. Even on a cell phone.